Your heart is racing. You shiver with fear. You've caught what's going around. You've got the fever, the frenzy and all the thrills. You're watching Outbreak. Big-name stars join director Wolfgang Peterson for big excitement in this breathless technothriller. Two-time Academy Award winner Dustin Hoffman plays Sam Daniels, a take-charge army virologist trying to stave off global biological meltdown. A rare killer virus from the jungles of Zaire has taken hold in a California community. It knows no boundaries. Its mortality rate is 100%. And some say the only way to stop its spread is to firebomb to town and everyone in it. Rene Russo, Morgan Freeman, Donald Sutherland, Cuba Gooding Jr and Kevin Spacey co-star in this nail-biting tale of the day that could become doomsday. $13.420 million on 2215 screens. Every few years, some disease emerges that gets built up as the official End of the World. Just a few years, SARS was supposed to kill us all before breakfast and eliminate the Martians by lunch. Instead, it disappeared without much of a trace. SARS reminded us how vulnerable we are to such disorders, though, and that�s a topic examined in 1995�s Outbreak. A preface introduces to a vicious virus that leads to the obliteration of an African village in 1967. Fast-forward 28 years, and the same disease slaughters another location in Zaire. The team led by the US Army Medical Research Institute of Infectious Diseases� Colonel Sam Daniels (Dustin Hoffman) inspects the site, and Sam believes the virus will soon threaten the US. And he�s right. A monkey infected with a vicious virus gets shipped to the US and ends up in a northern California pet shop. The primate eventually gets released into the wild, but not before she infects a few folks who came into contact with her. So there�s your outbreak! The disease quickly works its way into the community, and this leads to Sam�s involvement. He takes his team to NoCal to deal with the virus and attempt to prevent its spread around the world. In an online forum I frequent, a thread discussed �the worst movie you�ve ever seen�. A debate arose about whether the worst film you�ve seen automatically is the same as your least favorite. Some felt that the two go hand in hand, but I disagree. I can respect a flick and not like it, and I can also enjoy a movie I know isn�t very good. That�s the category into which Outbreak falls. To be honest, it�s a pretty absurd movie. It takes a chilling premise and turns it into goofy popcorn fodder. The flick boasts so many absurd scenes that it threatens to become comedic. For example, the story goes to silly extremes to spread the virus. Wouldn�t Jimbo think �man, I�m really sick � maybe I shouldn�t tongue my girlfriend�? Wouldn�t Henry want to cover his mouth instead of hacking all over the other movie theater patrons? I especially love the shot in which he nearly hurls all over the concession stand attendant. And then there�s the Evil Military Subplot. I won�t spill too many beans, as I prefer to avoid spoilers, but the movie goes down a ridiculous path to add drama to the climax. None of it makes a lick of sense, and it�s clear the choices exist simply to provide potential action and adventure. The Sophisticated Movie Critic in me recognizes that Outbreak is absurd and cheesy, but dammit, I enjoy it anyway. The film stretches credulity at almost all times, so much so that it nearly subverts its goals. Nonetheless, director Wolfgang Petersen knows how to pace a movie and make it zing, so those factors create an exciting piece of work. Viruses don�t seem like logical subjects for action flicks, but Petersen is able to bring out the slam-bang well. Those set pieces become the movie�s best moments, as they excite us despite their inherent lack of logic. Petersen peppers the film with enough of these pieces to allow us to slog through the sillier bits. The presence of a strong cast certainly helps. Via Hoffman, Kevin Spacey, Cuba Gooding, Jr., and Morgan Freeman, we find four Oscar winners here (though only Hoffman had captured a trophy when Outbreak hit the screens). In addition, we find established talents like Rene Russon and Donald Sutherland. This is a top-notch set of actors and a much better crew than one would expect for such popcorn-munching cheese. Not that any of them break a sweat. They get stuck with terrible dialogue � I wince when Spacey�s forced to utter �I hate this bug!� � and one-dimensional characters. For reasons unknown, the writers make Sam and Russo�s character Robby recently divorced former co-workers. Why? I suppose they think this will add pathos and drama, but it seems unnecessary. The relationship itself is fine, but the elements connected to their split bring nothing to the table. While none of the actors can make their characters three-dimensional, they do add credibility to the project. When we see stars like Hoffman and Freeman, we automatically accept the story as more believable than it probably deserves. The actors may not contribute great performances, but they still offer intangibles that benefit the flick. Objectively, Outbreak is a pretty terrible movie. It goes down predictable paths enlivened mainly by there absurdity. Nonetheless, the film provides enough brainless entertainment to overcome most of its weaknesses. 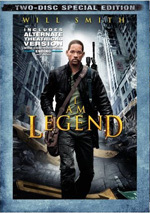 You won�t respect yourself afterwards, but you�ll enjoy this goofy popcorn flick. 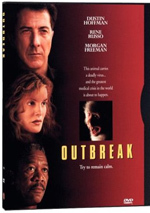 Outbreak appears in both an aspect ratio of approximately 1.85:1 and in a fullscreen version on this double-sided, single-layered DVD; the widescreen image has been enhanced for 16X9 televisions. Only the letterboxed picture was reviewed for this article. One of the very first DVDs ever released, Outbreak needs an upgrade in a big way, as this was a consistently poor presentation. Plenty of source flaws created concerns. I didn�t get the impression anyone put a lot of clean-up work into Outbreak, though I�m not sure why a then-two-year-old flick would require much effort to look good. The presentation suffered from a mix of specks, scratches, marks, and debris. These weren�t constant companions, but they created more than a few distractions. Digital artifacts were another problem. The movie often exhibited a grainy, blocky look due to the compression required to pack a 128-minute movie onto one layer of a DVD. In addition, the flick suffered from prominent edge enhancement at all times. The haloes surrounded objects and further reduced accuracy. Sharpness was inconsistent. Close shots demonstrated passable clarity and delineation, but wider elements were less distinct. Indeed, those shots tended to look downright blurry, as the edge haloes and the compression artifacts made them mushy. Colors seemed mediocre. Outbreak went with a fairly low-key palette, and the hues appeared acceptable. The various artifacts and source defects affected the tones, though, and made them seem somewhat drab. Blacks were fairly dark and tight, but shadows tended to be flat and too opaque. This transfer was good enough to avoid a rare �F� grade from me, but it remained a definite �D�. 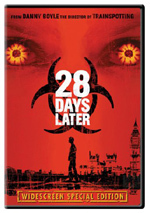 This was one of the ugliest DVDs I�ve seen. In contrast, the Dolby Digital 5.1 soundtrack of Outbreak was quite good. Though not reference level, it offered a pretty solid piece of work. The soundfield maintained an active and engaging affair. During the film�s quieter scenes, the forward channels dominated. They showed good stereo imaging for the score and also offered generally realistic ambience. Not surprisingly, this movie kicked to auditory life during its many action scenes, and those offered excellent use of all five channels. The action tended to fly hot and heavy as vehicles and explosions maximized the soundfield. The elements seemed appropriately located and they blended together nicely. The surrounds added a fair amount of unique information and meshed together in a positive way. Audio quality appeared positive. Dialogue came across as natural and warm, as speech showed no signs of edginess or problems related to intelligibility. Music seemed bright and vibrant, as the score presented clear highs and tight low-end. Effects packed a good punch. Those elements appeared distinct and vivid. They lacked problems related to distortion, and they demonstrated deep and rich bass response. Overall, the soundtrack of Outbreak worked very well. Only some minor text supplements appear. We get Cast biographies for director Wolfgang Petersen and actors Dustin Hoffman, Rene Russo, Morgan Freeman, Kevin Spacey, Cuba Gooding, Jr., Donald Sutherland and Patrick Dempsey. These are brief and moderately informative. The Production Notes deliver four screens of minor details about the flick. Patently absurd and often clunky, I should probably maintain a strong dislike for Outbreak. Despite its many weaknesses, though, the movie offers enough tension and excitement to make it enjoyable. The DVD provides excellent audio, but the visuals look terrible, and the disc includes no substantial extras. I can find some entertainment in this spotty movie, but the DVD itself is a mess.